More of the best, craziest, biggest and funniest! 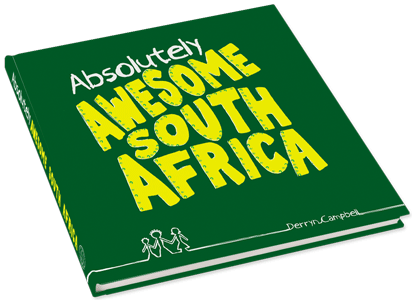 Absolutely Awesome South Africa is an entertaining compilation on South Africa which is packed full of fun, facts and trivia. This completely new coffee table book is packed with completely new content and design on every page and is full of South African humour, history and interesting facts. The vibrant and colourful pages of Absolutely Awesome South Africa captures the heart and the soul of this magnificent country. This book is available in Hard Cover and Soft Cover. 220 page of Facts – Fun – Trivia – Humour – Quotations – Culture & so much more! This book will be available from September 2015 at major bookstores, directly from the contact us page on this website or via the shopping cart on awesomesa.co.za. Discounts for bulk orders and institutions available on request. Contact us to enquire about the options for personalising the book for your clients. Copyright Awesome South Africa 2017. Developed and maintained by Smashing.